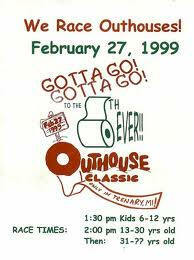 DIY - Outhouse Race Fundraiser! nothing to do with how fast one goes (no pun intended). Registration ranges from $15 for those 5 and under to $35 for those 50 and over. In addition to the races, main street Trenary provides for a day of the 4-F’s: fun, food, and family festivities. While you’re here, make sure to support our vendors and sponsors. You can even (that means you should) buy an OFFICIAL outhouse t-shirt, cap, headband (just like Michael Jordan once wore), sweatshirt, vest (very stylish), flask, pin, coffee mug (can also be used for other liquid refreshments), shot glass (not to be used as a target, so please don’t take the name too literally), cooler, greeting cards, and perhaps most importantly, can and bottle koozies. All items are available for purchase at the Trenary Outhouse Classic tent. All proceeds earned from donations, purchases and registrations go back to support the community of Trenary, MI. This certainly won’t work everywhere but it sounds like lots of fun. Can’t you just see this at a college or university?